Enhance the natural beauty and depth of grain in finished and unfinished wood with an unique blend of soft beeswax, hard carnauba wax and pure orange oil. 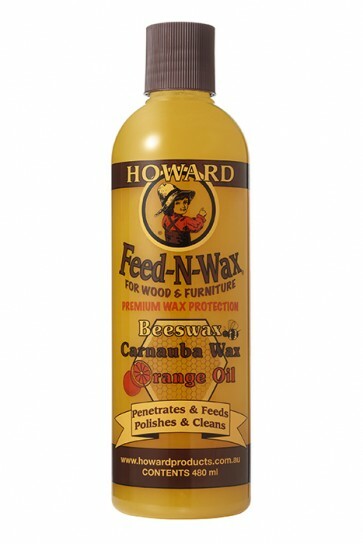 Maintain and enhance the beauty of furniture with Howard Feed-N-Wax with Orange Oil. Prevent drying and deterioration of all wood finishes. Polish all wood surfaces to a soft luster and protect with a coating of natural waxes. Use to maintain the restored finish after using Restor-A-Finish. Use Howard Feed-N-Wax to prevent drying and cracking while preserving the wood finish. Feed-N-Wax is a special blend of beeswax, carnauba wax, and orange oil. It enhances the natural beauty and depth of grain in finished and unfinished wood. Use Feed-N-Wax every couple of months to maintain the natural beauty of your wood finish. Polish all wood surfaces to a soft lustre while leaving a protective coating of beeswax and carnauba wax. Feed-N-Wax works best when you leave it on for about twenty minutes before buffing off. Howard Products recommends that you use Feed-N-Wax to enhance natural beauty & depth of grain in finished & unfinished wood. Contains Beeswax, Carnauba wax and orange oil.